Have you heard of Mashiko's Climbing Kiln? It is a collection of kilns located on a slope. Each kiln has its section on a set of stairs. They are made out of bricks that are heat-resistant, and it costs a few million yens (tens of thousands dollars) to make one. 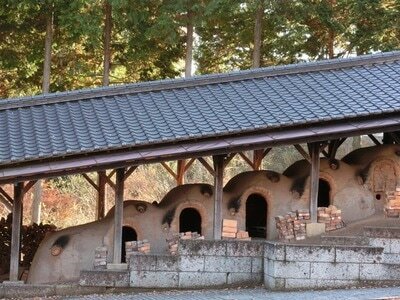 People who specialize in building the set of kilns are called "Chikuyoshi", and there are only 2 of them in the entire city of Mashiko. 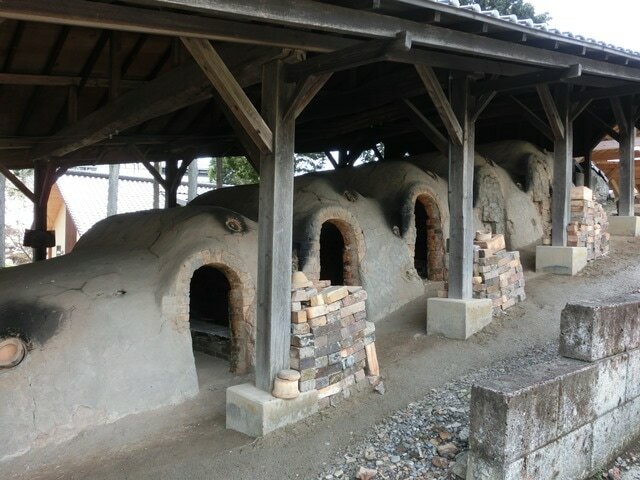 There are currently 10 Climbing Kilns in total that are being actively used in Mashiko. Among them is the one in ”To-gei Messe”. Have you visited the place already? 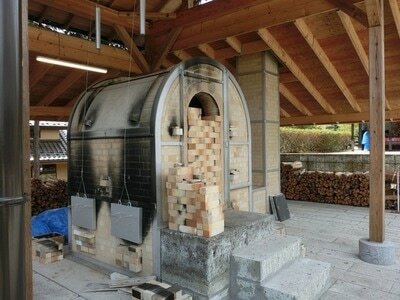 That Climbing Kiln was built about 30 years ago just for display purposes only. But one day, someone suggested that they should try using it. For everybody's surprise, it actually worked. Some of the bricks that were used to build the Climbing Kiln at ”To-gei Messe” were not heat-resistant, so those bricks melted away. 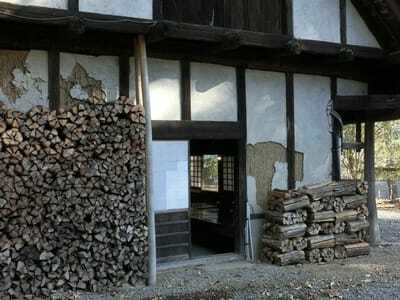 They were able to replace them, however, with heat-resistant ones afterwards. And it has been used as a functional Climbing Kiln. 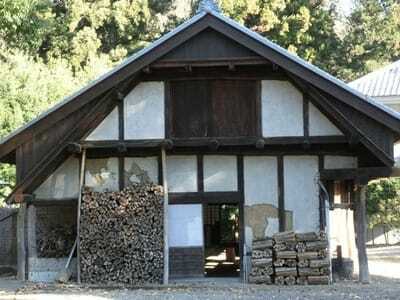 It shows a typical Japanese craftsmanship - they built them properly even though they were supposed to be just a display. Last summer, they have built a "Kakugama" next to the Climbing Kiln, which is a single kiln. Many artists from oversees visit it while staying at a nearby designated accommodation specifically for them. They enjoy creating their pottery with local Mashiko potters. The sent of burning firewood tickles your nose when you arrive in Mashiko-cho. 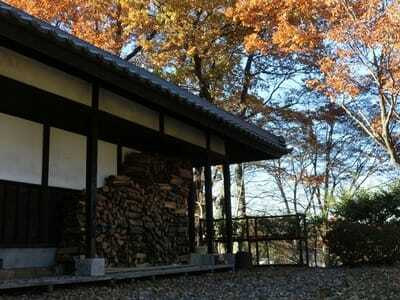 Fire places are popular as Mashiko-cho is in woodland, but it is still a reminder that you are in pottery city. In front of the pottery-making family homes, bundles of firewood are stuck up in an orderly fashion, which have a charm of their own. 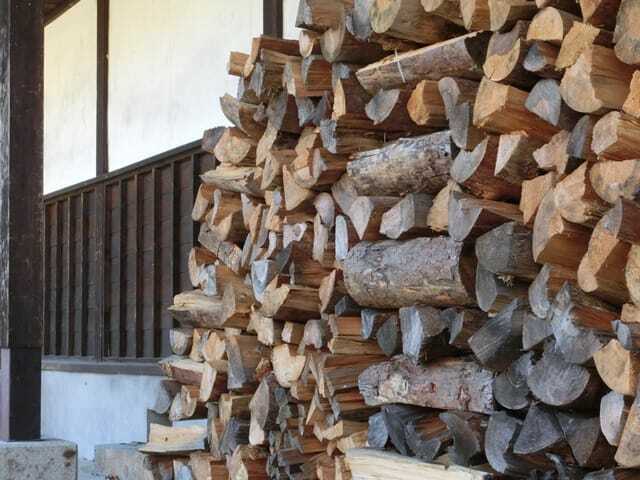 According to Otsuka-san, the best and most appropriate firewood for pottery-making is Japanese red pine trees. 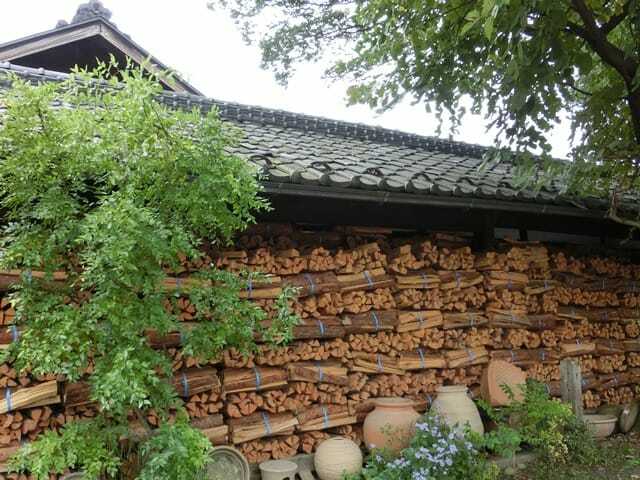 The tree oil from their pine tars fule high temperature fire, and their thin barks produce less ashes, therefore they won’t stick to pottery as much. Pottery is produced in places where high quality soil, clay and pine tress are found, which leads to cultivation of prosperous pottery culture. 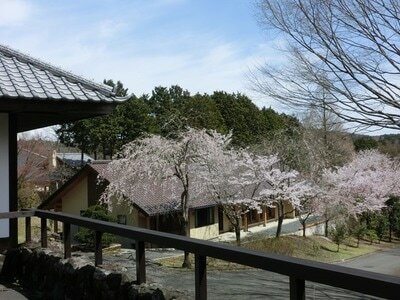 In other words, Japanese-red pine trees are also found in Mashiko-cho – well, they did in the past. Non-Japanese pine-eating insects and parasites from overseas took over and caused the Japanese red-pine trees to die out in the region: thus, Mashiko-cho is currently buying these firewood from other prefectures in Japan such as Nagano and Iwate. 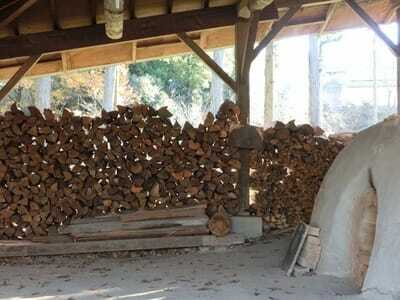 Gas, electrocity and oil are commonly used for fuel, and even though firewood is the most expensive type of fuel for pottery-making, it helps to create unique and profound pottery. Have you heard of the big racooon statute sitting next to Kyohan Center in Mashiko? The name is "Ponta", and it always comes up when talking about Mashiko. Why a raccoon you ask? A raccoon is called "Tanuki" in Japanese, and it's a play on words that means "exceeds others". ("Ta" = Others; Nuki = Exceed). 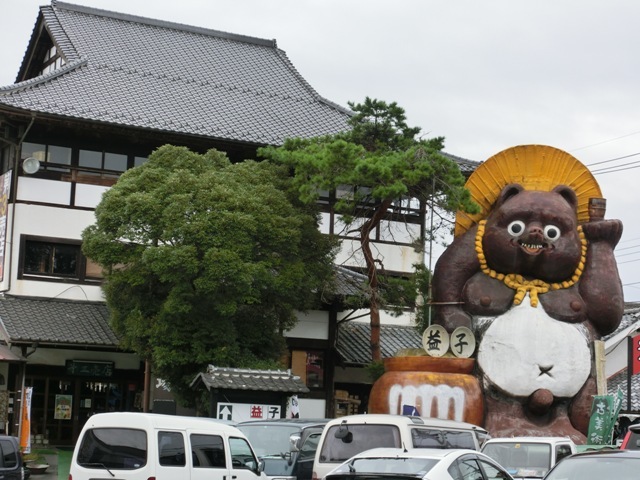 They built this statute 30 years ago in hopes for prosperity, and it has become the mascot of Mashiko-Cho. "Ponta is made out of fiberglass except the Japanese tea cup on its hand, which is actually Mashiko pottery" says Otsuka-san. 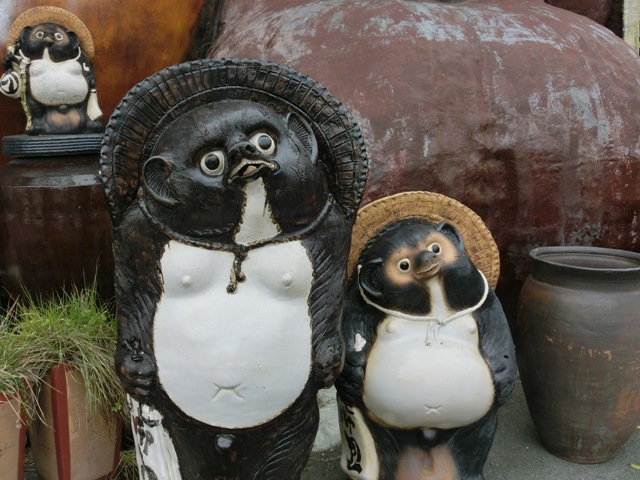 On a side note, the two smaller raccoon ornaments are Shigaraki pottery, which is a famous type of pottery that is practiced in Shiga pref.